Our Great Room offers ample space for your church retreat to hold meetings or socialize in a casual atmosphere. Our church groups like that their large group is all under one roof and can meet and worship comfortably in the quiet of the mountains. The large game room contains ping pong, air hockey, satellite television, a movie library, puzzles, and games for additional relaxation and entertainment. The large covered deck has ample seating for groups to meet outside when the weather is pleasant. 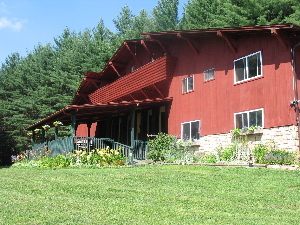 We can help in planning activities, either at The Ponderosa Lodge or nearby, for your church retreat. At the lodge, we provide farm and garden tours, educational nature hikes into our 16 acres of woodlands, and cooking and canning classes. We also work with local partners to organize whitewater rafting on the New River or Gauley River, skiing at Winterplace, rock climbing, fishing, horseback riding, tree canopy tours, boating, hiking, or a team building ropes course to challenge your group and help you grow. Copyright ©2005, Ponderosa Lodge LLC, All Rights Reserved. No part of this website may be copied, reproduced or broadcast without written permission of the copyright holder.